Audience: This book will be enjoyed by all people ages 4 and up. Summary: Wemberly worries about absolutely everything…..from shrinking in bathtub water to losing her parents in the middle of the night. Although her parents and laid-back grandmother try to convince her that there is nothing she needs to worry about, she is not convinced. Just when you think she could not possibly worry about one more thing, she faces her biggest fear ever…..the first day of school. 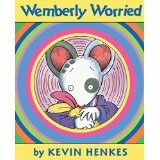 Literary Elements: Wemberly Worried is a precious and humorous work of fiction in which Kevin Henkes’s famous mouse characters assume the thoughts and feelings of many young children facing change and separation. Henkes’s sense of humor and compassion shine through as he explores the fear and anxiety that children so often experience in this world, especially when they face big changes, like the first day of school. Compassion mixed with humor work in this book to shed light on our worries without feeling like those worries are being criticized or harshly judged. Perspective on gender/race/culture/economic ability: One of the beautiful things about the mice that Kevin Henkes so often employs in his picture books to depict normal, human emotions is that his characters come in all shapes, sizes and colors. The mice represent each one of us and the culturally universal experience of attending school for the first time. Whether you are rich or poor, black, white or tan, you can relate to or at the very least laugh at Wemberly’s fears and concerns about leaving the familiar surroundings of home to spend a day at school with new and strange people. Theological Conversation Partner: Jesus tells us in Matthew 6:25-27: “Therefore I tell you, do not worry about your life, what you will eat or what you will drink, or about your body, what you will wear. Is not life more than food, and the body more than clothing? Look at the birds of the air; they neither sow nor reap nor gather into barns, and yet your heavenly Father feeds them. Are you not of more value than they? And can any of you by worrying add a single hour to your span of life?” This book and a discussion about its message would benefit children about to enter kindergarten, or even older children who may appreciate a lighthearted book about entering a new phase of life. Is Jesus’ call to “not worry about your life” something that is even possible to achieve? Why or why not? What are some of the things you worry about? Are you more like Wemberly, who worries constantly? Or, are you more like Wemberly’s grandmother who lives by the motto “Take it as it comes?” What are the positives and negatives about each personality? Wemberly Worried by Storypath is licensed under a Creative Commons Attribution-NonCommercial 4.0 International License.